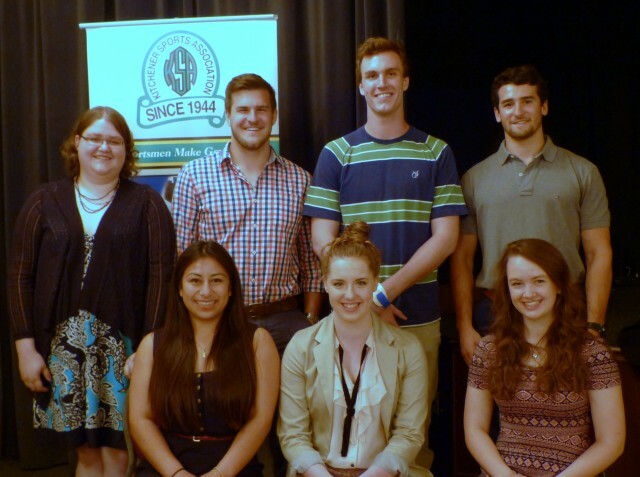 PHOTO: The 2014 KSA Scholarship recipients. (Back row l-r): Rachal Bolger (KCI), Addison Cober (Waterloo Oxford), Quinn Turner (Sir John A. MacDonald), and Ben Fanelli (guest speaker, Kitchener Rangers Captain). (Front row l-r): Helen Coroy (Cameron Heights), Holly Gojmerac (St. David's) and Leah Nairn (Cameron Heights). Ben gave an inspirational talk and wished this year's scholarship recipients all the best. The recipients shared their thoughts and plans as they get ready to for the next step along their career paths. As well as our best wishes, each of this year's scholarship recipients also received $2,000 towards the cost of his/her first year's tuition. This was the last KSA dinner before our summer break! After a great summer - hope you'll join us again on Sept. 16. Sept. 16, 2014 - our 1st dinner in our 70th season!